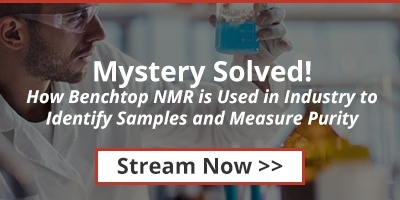 Stream the Webinar: How Industry Uses Benchtop NMR !! Verifying raw materials being used in the neutraceutical industry – Ascorbic Acid is used as an additive in many foods and dietary supplements. The current USP methods used for verifying sample identification are time consuming and expensive. In this webinar we demonstrate an alternative, NMR-based method for ascorbic acid identification that provides a number of significant advantages over the existing approved methods. Measuring purity of products in the pharmaceutical industry – The purity of APIs that are used in medicines are tightly controlled by the USP. Chromatography is the most common method for quantification of pharmaceuticals, but it can be a time consuming process. In this webinar demonstrate how we can meet the USP measurement specifications for the purity of Lidocaine. Stay tuned for details of our next webinar.